Is Sailor Moon becoming a queer icon? Recently, the word "queer" has become a more popular umbrella term for people who identify as LGBTQ. That said, I feel like Sailor Moon, as a show itself, is becoming a queer icon. Several young LGBT-identified actors have confirmed they're fans of the show. Rowan Blanchard, who said she identifies as queer, dressed as Sailor Moon for Halloween one year and has several posts related to the show on her Instagram. Keiynan Lonsdale, who recently starred in the gay teen romantic comedy Love, Simon and identifies as bisexual, owns several Sailor Moon t-shirts. Has anyone else noticed what I'm noticing? Or is it just me? 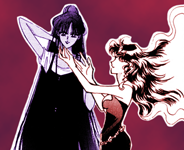 Sailor Moon has had LGBT associations (especially LGB) since it first came out, due to it's memorable and mostly-sympathetic portrayal of Haruka and Michiru, and debateably of Zoisite and Kunzite. The anime made it very clear that regardless of what mistakes or wrong choices or harm they did in the rest of their lives, their romance was a strength, and that it was no less powerful nor real a form of love. Usagi is also very flirty with girls in terms of the extent to which she admires them, blushes, had a kiss with Haruka in the manga, nuzzles with Rei whilest blushing in the anime (near the end of R when Chibi-Usa is missing and Rei's trying to cheer her up), and so on. Or that scene in the alley where Makoto stares at Ami's back end when she falls over, or more romantically, that big dance scene with Ami and Makoto where Makoto was doing the wallflower thing and Ami was doing the romantic go up and ask the wallflower to dance thing... yeah. They like to flirt with the line of bisexuality quite often. The trans stuff is less developed but that there's any to speak of is noteworthy. Zoisite is an extremely effeminate man (while Kunzite is not), although conflating transsexuality with homosexuality is problematic and tricky but whatever, I can appreciate how femininely cool Zoisite is for it's own sake without worrying about that. Fisheye moreso seems to prefer dressing as female at every given opportunity and could easily be considered female even in his(?) regular clothhing with the puffy blue jacket-suit thing. In any case, Sailor Moon managed to get through 200 episodes with almost nothing in the way of negativity towards LGBT subjects (there's some weirdness about Makoto showing interest in Haruka, briefly, sort of, once, offhandedly), full of attractive characters both masculine and feminine, yet of either gender (masculine girls and feminine guys too) and with at least semi-positive, decidedly sympathetic portrayals of homosexual couples, and a noticeable bit of lean towards bisexuality in it's main characters. Notice how even Fiore's romance for Mamoru is treated more sympathetically than Beryl's, as more of a tragedy and even sort of parted on good terms. Anyway, I don't think any of that's new. If anything it might be that you could find more people complaining that Sailor Moon isn't consistently pro-LGBT enough or something, because as LGTBQ stuff has thankfully become more widely accepted, there's also more degrees of people arguing over whether any given representation is positive or not. Such is life. But I do think there's some positive feelings to be found in Sailor Moon as a moderately pro-LGBT kind of a thing. I like it. What I'm saying is, with the show experiencing a resurgence in popularity in recent years, and with the original subbed version becoming more widely available, more Western fans are exposed to the fact that there have been queer characters in this show they've loved all along, they were just censored (e.g. Uranus and Neptune being lovers, not cousins). I don't think there was much public knowledge of queer characters in the show about fifteen years ago because most Western fans had only been exposed to the English dub. Now, the show is becoming more common and celebrated in LGBT culture, I'm noticing. According to various polls we had in the past, about half members of this forum are gay/bi/transgender, which is way higher than average % of population anywhere in the world. I think it has been for awhile. Perhaps more so in West, I think. Most of the die-hard Sailor Moon fans I've come across have been LGBT. I don't exactly agree with a lot of the portrayals of homosexuality in Sailor Moon, but I won't deny it's progressive in many ways. I don't think a single person ever believed Uranus and Neptune were cousins. I'm sure even dub-only fans could see through that facade. Yeah, even 15 years ago lots of fans were aware of these characters. There were a lot of fan sites and information available back then even if the content itself wasn’t available. Like EVERYONE knew about Uranus and Neptune. Maybe more casual fans didn’t know but it doesn’t seem like there’s a huge difference in awareness between then and now. Gay people and others have always been drawn to the show. It’s progressive in some ways and flawed in other ways regarding this topic. But I don’t really consider Sailor Moon to be an LGBT icon. Uranus and Neptune might be iconic but in general, I just don’t see it based purely on what the OP is saying. People owning T-shirts and dressing up means they’re fans. "Sailor Moon" is a series that emphasizes themes like love, friendship, redemption, and acceptance, which are all things that resonate with queer audiences. The Sailor Team is in many ways a "found family." I think that's the real reason the series is so popular/"iconic" with people who identify as LGBTQIA. The inclusion of queer characters (however they may be depicted), the colorfulness, and the camp value are added bonuses. If it seems like "Sailor Moon" is suddenly more popular (among queer people), that's probably just due to the increased presence of social media in our lives and how social media/the internet have allowed queer people a space to express themselves louder than ever. There are so many LGBT moments tossed here and there. No wonder many people like it. The show is indeed pro- LGBT. However, this isn't the only thing that attracts people. Many people like the story too. I agree you can really it's an lggqbt icon.Because LGBT people like it.When. 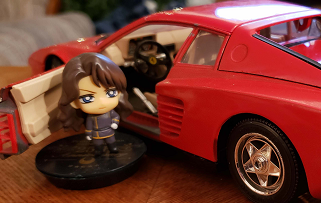 I read the manga,and watch the anime. I just felt like it was a series gear towards teenage girls, and children. You can say it was progressive for united states. Not for Japan, because Japan at that time had querr characters in the anime. So I'm the only person who bought the "Uranus and Neptune are cousins" thing at first? You may not be the only person but it’s definitely a rarity. How old were you when you first watched them? That might have something to do with it. Most fans around here were aware of Uranus and Neptune being lesbians before S even aired on TV overseas. We knew about the characters and the show in general a few years before they made their English dub debut. Shes pretty much been one for a while now the show is pretty much on a level similar to Buffy the Vampire Slayer and Xena Warrior Princess. I didn't thoroughly read all the comments but did any one see this a few years back? I think so! The show had so many moments that showed acceptance of wlw, and Haruka is an icon herself. I definitely think the show is an LGBT icon I refuse to use the word queer because growing up that was a very insulting word people used towards LGBT people so I don't like to use it. Me personally as a trans kid growing up when I found out about all of the LGBT characters it made me more entranced to the show. Even when I watched the edited dub somethings didn't make sense about certain characters that were heterosexualized. Like for instance Zoisite Kirsten Bishop did an excellent job with the female Zoisite but I always noticed that Zoisite seemed to have a more masculine body in comparison to the other females on the show. Pretty much every other female character had a quintessential female shape of an hour glass figure, feminine looking breasts etc where as Zoisite was decidedly more boxy and masculine in her dimensions. Learning that Zoisite was original female obviously made more sense. 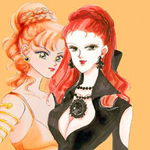 As for Haruka and Michiru I could tell something was up. They called them cousins but they had so many romantic scenes hell there was one scene where the two were nearly kissing and I was like WTF they are supposed to be cousins?! Really in censoring the two they honestly made their relationship even more scandalous. So again I wasn't shocked to find out they were truly unrelated lovers. Now I totally believed Fisheye was a woman because for one in alot of his outfits he had a more feminine shape in some shots in his disguises it looked like he had breasts. Whether he was just a wizard and stuffing and pulling as I have seen some drag queens who are able to make it look like they have breasts with some drag contouring skills or if Fisheye outright used magic to change himself into a woman is not clear but either way Fisheye had a more feminine shape then Zoisite did. Of course once I saw the episode where Fisheye went full shirtless it was clear he was a guy. That was also a unique episode as Fisheye did not wear a female disguise but adopted a more masculine boyish disguise as it was pretty much implied that the fashion designer Yoshiki Usui was gay he even had a guy that was coded as his lover of course the dub censored him as well to make him Yoshiki's brother. I was about nine years old when I first saw Uranus and Neptune. I had never even heard of the original version at the time, and I also hadn't really had any exposure to the idea of homosexuality. It wasn't until around sixth grade when I learned the truth, and that was from reading about the original and watching clips on the internet. As a kid even before i knew anything or had internet access I could tell they were more than just cousins. Nothing about their lovingly staring into each others eyes and their hand stuff resembled anything I had seen family or friends do. Zoicite though I never really had any idea about I mean Zoicite is really so feminine that nothing really tipped me off about that I mean even his teleportation was flower petals lol. I mean in hindsight the broad shoulders and flat chest is somewhat of a give away but I just assumed that was just due to the cut of the uniform and a more mature frame. Personally, I would never get a tattoo, and much less a "Sailor Moon" one. That being said, I see many gay men over 30 with "Sailor Moon" tattoos. Just browse Instagram and Tumblr. As others have said, this show didn't just become a show with a large LGBT fan base, but has always had one. However, I read the situation slightly differently. It isn't just the representation, the themes, and the presentation that made the show appeal to an LGBT audience; those things helped. It's more that the LGBT audience stayed when many of the straight fans just stopped watching. Twenty years ago, most of the people watching Sailor Moon were kids and teenagers. Between that and even the stigma that remained about adults talking about kids cartoons in the 90's, people who watched the show for what it was. Even fans who complained about the dub being worse than the original version didn't analyze the show for themes of sexual representation (notice how a lot of certain old dub-bashing sites were flat out complaints and not criticism and argument -- that's because the fanbase itself was immature at the time). Most of the show's old fans moved on when it stopped airing. Thus, the people like us, who stuck around had a stronger personal attachment to the show. For some, it was the aesthetic. Even to this day, Sailor Moon has a unique visual balance. For others, it is the idea of an all-girl team. For me, it was the unique combination of Greek and Roman mythological elements filtered through a Japanese lens and blended into a fairy tale of reincarnation, elemental warriors, and superheroes; up until Sailor Stars, I love the universe of Sailor Moon (especially the old dub's version) much more than most of its main characters. However, for a Western LGBT audience especially, Sailor Moon appealed to them at the core because of what other posters had mentioned. Aside from the LGBT characters and the themes of acceptance, there is also the idea of heroines who are seemingly normal everyday girls who transform into their true selves to fight villains. Unlike most superheroes who forge their own identity, the Sailor Guardians are taken from their past lives, conditioned from birth to accept their new identities, only to awaken into who they are...and the canonical end game for them is to live as who they used to be openly, not who society tells them they are. That idea appeals to just about anyone who is marginalized, but especially an LGBT audience. These fans would stick with Sailor Moon because it was meaningful on a level beyond "entertaining cartoon." While I do caution that Sailor Moon isn't as progressive as fans like to make it out to be, I do have to admit that for its time, it was a trend-setter in terms of anime. Yes, there were LGBT characters in anime before Sailor Moon, but a lot of those characters were side characters or gag characters in works aimed at younger kids. At its airing, in Japan, Sailor Moon was probably the most prominent kids anime that featured LGBT characters as central parts of the narrative. You're not. Some fans did buy it, especially when they were younger. However, by the time Sailor Moon S was dubbed --there was a significant gap in time between the dubs of Classic and R and the start of S-- the Internet fans had "spoiled" the series for most of us fans. In fact, many fans weren't wondering if the dub would censor Uranus and Neptune, but how they would. Most of us speculators were thinking it would be the "best friends" route with the cutting out of the romantic footage, and a couple were thinking "sisters" (they DO have similar features) but NO ONE thought it would be "cousins." That makes sense. I didn't have a computer when S started airing in North America, so I rarely got on the internet.